In this article, learn how to fix "The network path was not found (error code: 0x80070035)" in Windows 10/8/7, while accessing the Network Access Storage. Network Attached Storage (NAS) basically helps you to share the data across machines in a localized environment. NAS uses file sharing specific protocols for this purpose. So using this phenomenon, you can simply connect your Windows 10 using HomeGroup or WORKGROUP. This will help you to share the content instantaneously across the machine with less efforts required. This this error is expected to occur if NetBIOS over TCP/IP is not enabled on the machine. However, other factors may also involve and cause this issue. So users victim of this problem may try below mentioned suggestions and see if they could help to suppress the issue. 1. Make sure your system using Server Message Block (SMB) protocol version 1. SMBv1 protocol can be enabled using either ways mentioned in this post. 3. Temporarily disable the third-party security software such as antivirus etc. and check the issue status. 4. In Device Manager, expand your network adapter, right click and select Uninstall. Then click Action > Scan for hardware changes. This should reinstall the adapter and see if the problem appears then. 5. Go to Control Panel > All Control Panel Items > Credential Manager > Add a Windows Credential and type name of each machine, its user and corresponding password. After saving credentials the problem may be solved. 6. Navigate to Control Panel > All Control Panel Items > Network and Sharing Center > Advanced sharing settings. Under Private profile, for HomeGroup Connections, select Use user accounts and passwords to connect to other computers option. Click Save changes and exit Control Panel. If you still have the issue, try FIX 2. 2. 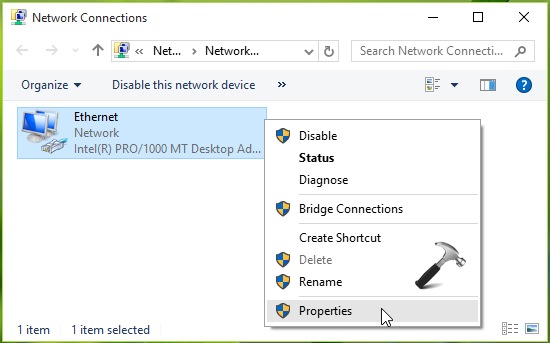 In Network Connections window, right click on your primary network adapter and select Properties. 3. Next, on the property sheet, at Network tab, select Internet Protocol Version 4 (TCP/IPv4) and hit Properties. 4. On TCP/IPv4 property sheet, click Advanced button. 5. Finally, on Advanced TCP/IP Settings sheet, on WINS tab, under NetBIOS setting, check Enable NetBIOS over TCP/IP option. Click OK and return to Desktop. This should fix the issue significantly and you may now be able to access the share without any error. Related fix: The network location can’t be reached (error 0x800704cf). It just happened yesterday after the Windows 10 update. Somehow Windows disable the NetBIOS setting so I couldn’t access any network resources but internet. User the default setting resolves the issue. Thank you so much so pointing to the right direction! Hi one of my job which will run and place the file in my NAS share. But due to some reason the job got failed with error message network path could not found. We suspect that this is because NAS unavailable during that time. ^^ You can try above mentioned suggestions and see if they helps!